Juan Tequila - San Diego Dining Dish! 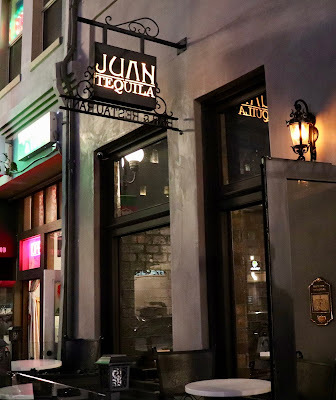 Juan Tequila recently opened in the Gaslamp District, giving San Diego one of the most impressive tequila bars/restaurants in the metro area. 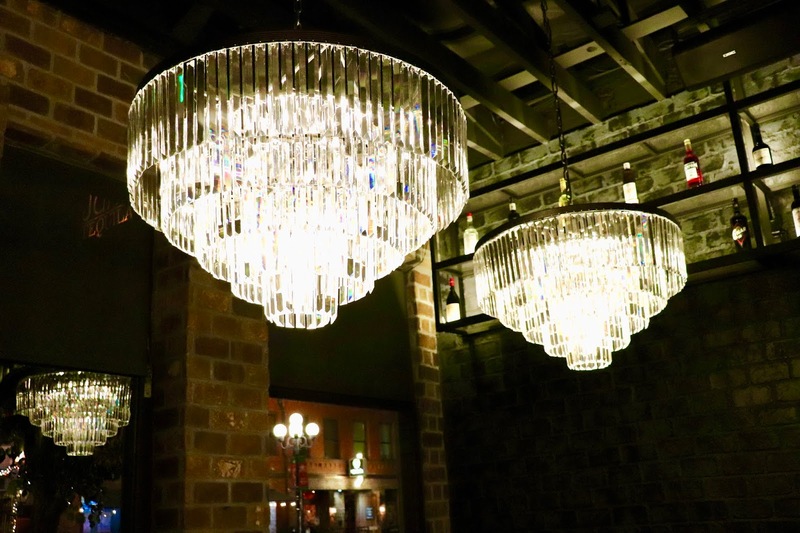 The location is in an unassuming corner of the Gaslamp, which gives it kind of a speakeasy feel. The bar is an absolute stunner. Dimly lit, then exploding with light from lovely glass chandeliers and a backlit bar that only Mrs. Incredible could nimbly handle due to its height! We were lucky enough to be invited to try out some of their tequila cocktails and custom menu last week before taking in the Waitress musical (so good!). 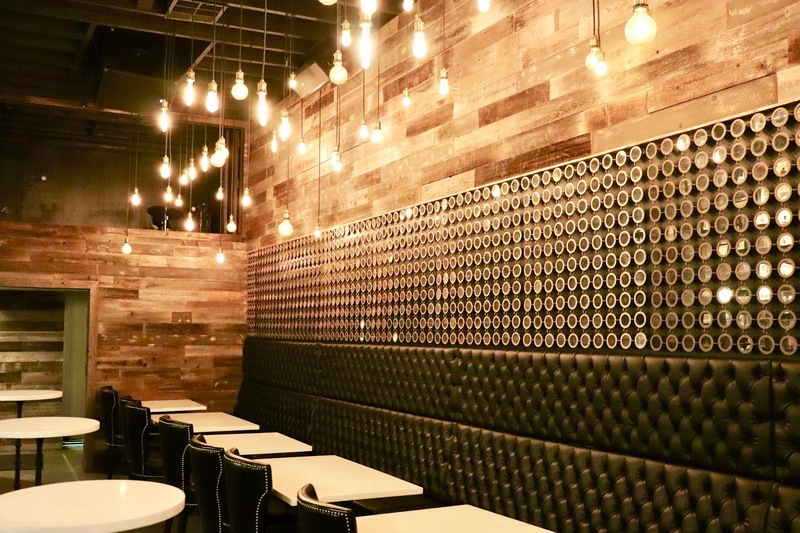 I love how the design of the restaurant/bar is like a grotto with beautiful lights. It felt incredibly cozy and secretive, almost. It's a place for sharing secrets! 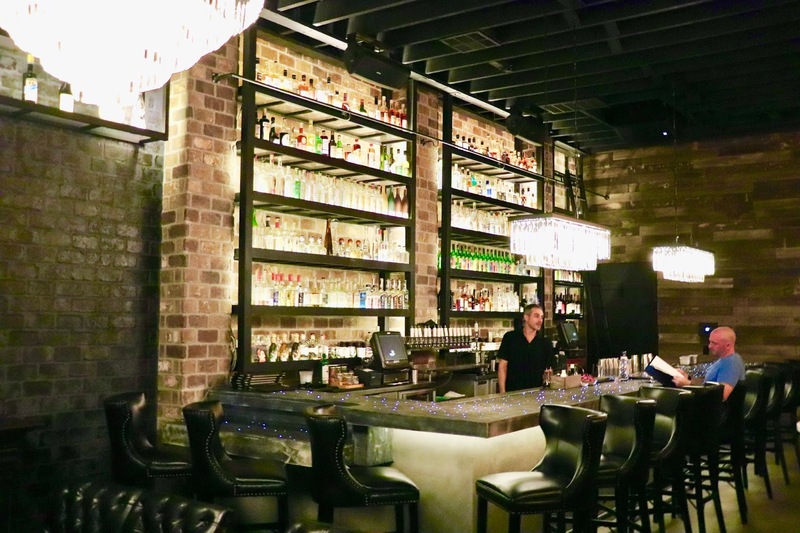 The place is named Juan Tequila, so it should surprise no one that the specialty is tequila shots and cocktails. I'm way too old and lame for shots, so we went with the cocktail option. We tried the Raicilla when i see ya and the Merla. 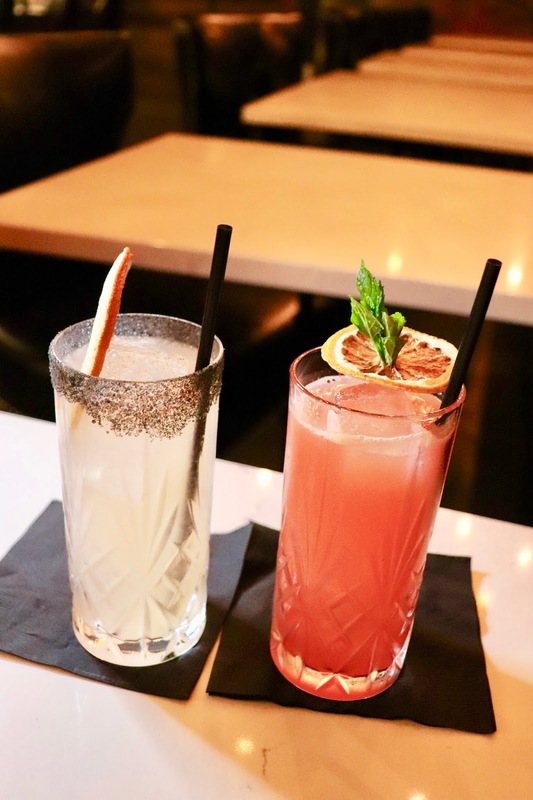 The Merla was a twist on the classic Paloma cocktail, grapefruit juice mixed with tequila and black salt for interest. The Raicilla was tequila, raicilla, blood orange, basil, and lemon. Both were sweet and refreshing, with a colorful appeal. We started with some Chesapeake Bay oysters served with Tapatio, ponzu, and limes. 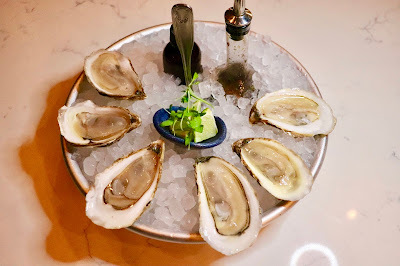 I love raw oysters, and these are on special every weekday from 5-7. Eating raw oysters is like tasting the ocean, and eaten in San Diego, with a great cocktail is near nirvana. Juan Tequila has a snacks menu in addition to their appetizers, for just an easy bite with a cocktail. 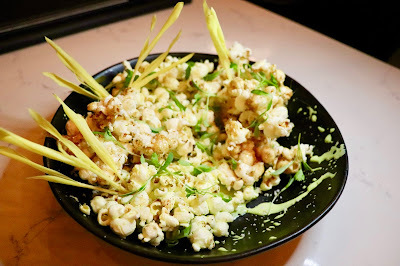 One of the items is the popped elote: popcorn served with an elote sauce, slightly sweet and then spicy and salty when dipped into the limey, creamy sauce. 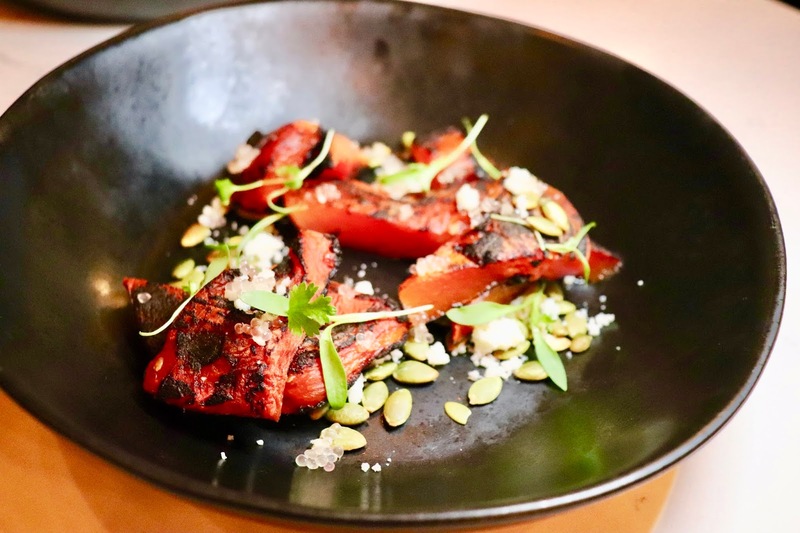 A great appetizer, particularly for vegetarians, is the watermelon y lime. It's compressed watermelon with lime juice, pepitas, and cheese. Remove the cheese to make it vegan. 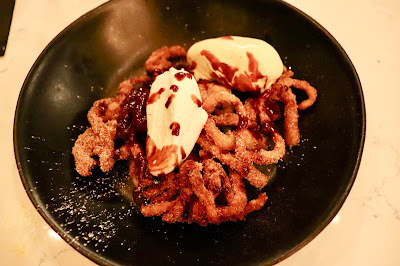 This dish wasn't sweet at all. In fact, the watermelon almost had a steak-like texture and flavor. Unusual and definitely something to try. Chilaquiles are a San Diego staple for breakfast, although I never had them before I moved here. I'm positively addicted to them now. Basically, chilaquiles are tortilla chips, salsa, and eggs, scrambled together with any additions desired. 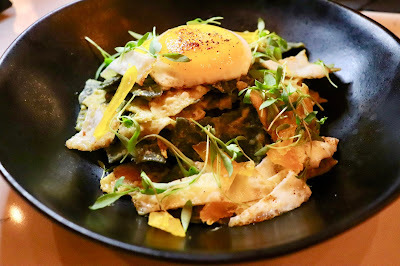 This version included a sunnyside up duck egg, cotija cheese, and salsa verde. It was delicious, and the perfect size to share. 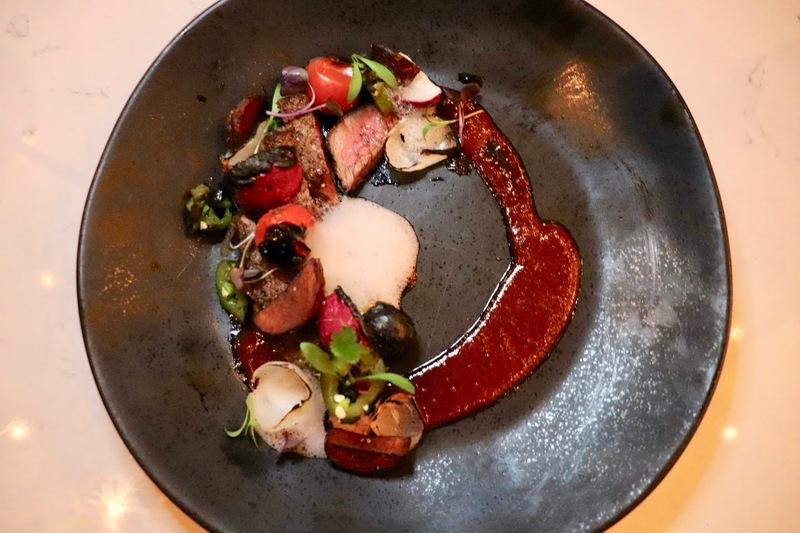 The main dishes are something else, with a lot of creativity in each serving. 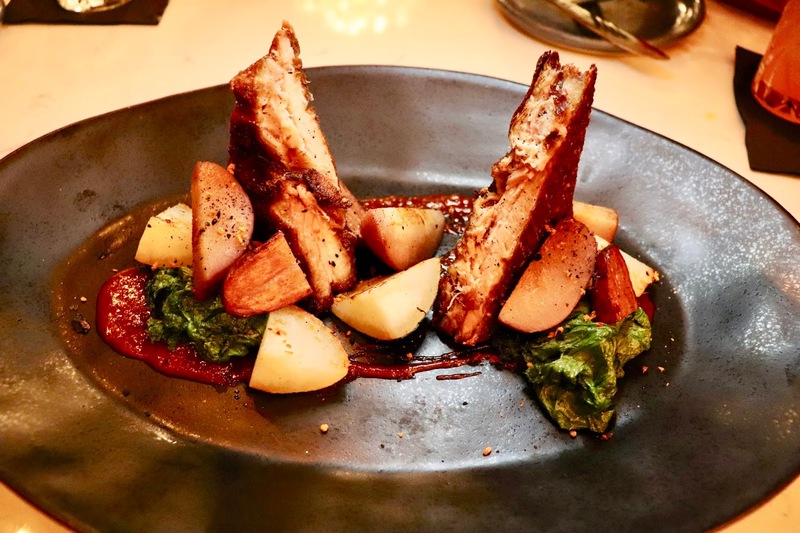 The pork belly verde was such a dish, with crispy pork belly served up with potatoes, mustard greens, and poached pears. It was a wonderful medley of sweet and salty, with a lot of texture and flavor. Probably the most unusual dish that I've ever eaten, but one of the best, was the deconstructed burrito. It was confusing at first, but was a neat, light way to eat a burrito. The foam pictured was the tortilla, with salsa roja, filet mignon, potatoes, and peppers scattered onto the plate. This kind of experimental cooking has a lot of room for error, but the chef executed this perfectly. I highly advise giving this a try! We barely had room for dessert -- a pile of churros topped with chocolate sauce and ice cream. Decadent, and perfect after all of the savory foods. 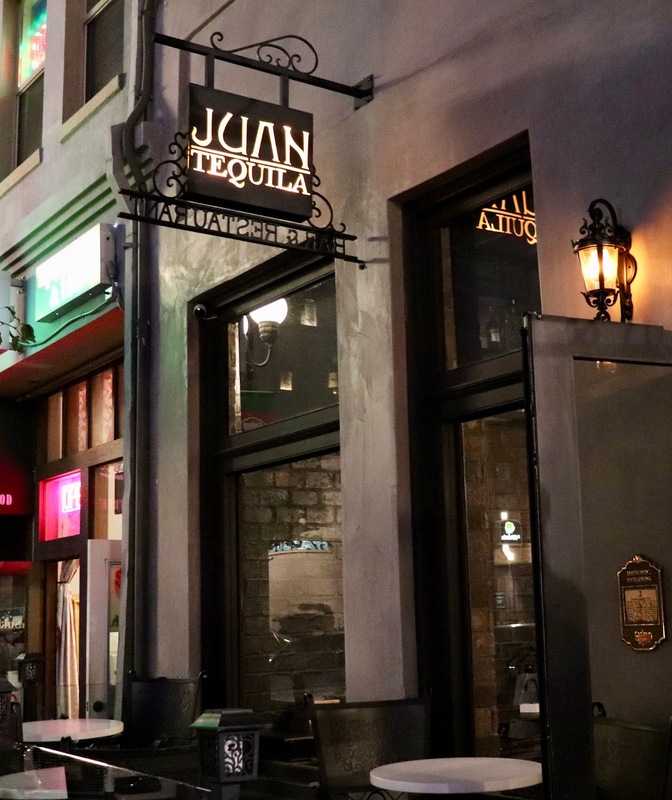 Juan Tequila is located in the Gaslamp, open for dinner each day.